Exercise, including the Bikram form of yoga, may raise serotonin levels. While yoga is usually a calm and relaxing practice, Bikram yoga is a bit of a different animal. The yoga room is heated, the poses are challenging and the pace is aggressive. Feeling stressed yet? As it turns out, it is the stress of a Bikram yoga session that offers surprising mental health benefits, including a possible boost in serotonin levels, an important hormone responsible for regulating your mood. Regulating serotonin levels helps to thwart depression and improve your overall mental state. If you are in a bad mood or are having trouble sleeping, a low serotonin level may be to blame. Serotonin is a hormone that is classified as a neurotransmitter, sending nerve impulses between nerve cells. Serotonin may play a role in regulating your mood, sleep patterns and learning capabilities. Serotonin levels fluctuate with the seasons, and serotonin’s impact on the body differs between men and women. Many antidepressant medications work by chemically raising serotonin levels. Exercise, such as yoga, is a natural way to boost your serotonin levels. Performed in a room cranked up to 104 degrees Fahrenheit with 40 percent humidity, Bikram follows a grueling routine of 26 challenging poses in a 90-minute session. There is no question that Bikram is an intense physical workout, but this form of yoga also recharges your mental state. It strengthens your mental focus and discipline. In particular, vigorous yoga practices may be therapeutic for mood disorders. Many followers experience a sweat-drenched euphoria after successfully completing a Bikram session, akin to a runner's high. 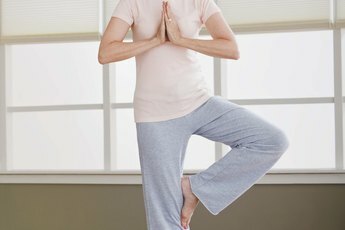 While a direct link between yoga and serotonin levels is still being researched, several studies suggest exercise boosts serotonin production, according to a 2007 summary of those studies published in the "Journal of Psychiatry & Neuroscience." According to the author, it is the exercise itself, and not just a psychological reaction to the exercise, that raises serotonin levels. According to his analysis, the studies also suggest a "possibility that the interaction between serotonin synthesis and mood may be 2-way, with serotonin influencing mood and mood influencing serotonin." 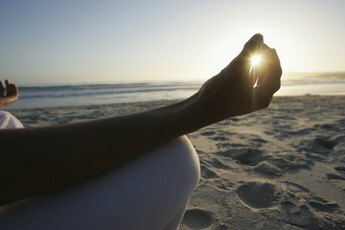 As discussed in the "Psychology Today" article “Yoga: Changing the Brain’s Stressful Habits,” it is the very stress that a demanding yoga session generates that's responsible for the mental clarity and calmness you feel afterward. Because Bikram yoga demands mental focus and centered breathing, it retrains the brain to not overreact in stressful situations. Physically speaking, Bikram yoga builds, strengthens and tones muscles, increases flexibility and balance, and improves posture. On the psychological level, Bikram makes you mentally tougher and more focused and brightens your mood, which can help regulate your serotonin level. If you are looking for a physically challenging and mentally invigorating exercise regimen that naturally lifts your mood, this form of hot yoga may be ideal.